No matter how satisfied a person is in his current job, there comes a time when he or she decides to switch to a new job and serve two weeks notice before the person decides to resign from his current job. The reason could be anything like- higher compensation, better benefits, work hour flexibility, learning opportunity or easier commute. Apart from a new job opportunity, there arises situations like – ill health of your own or close family member, child care, other personal reasons. In such situations, a person often thinks to take a break from his or her career and focus on the problem at hand. 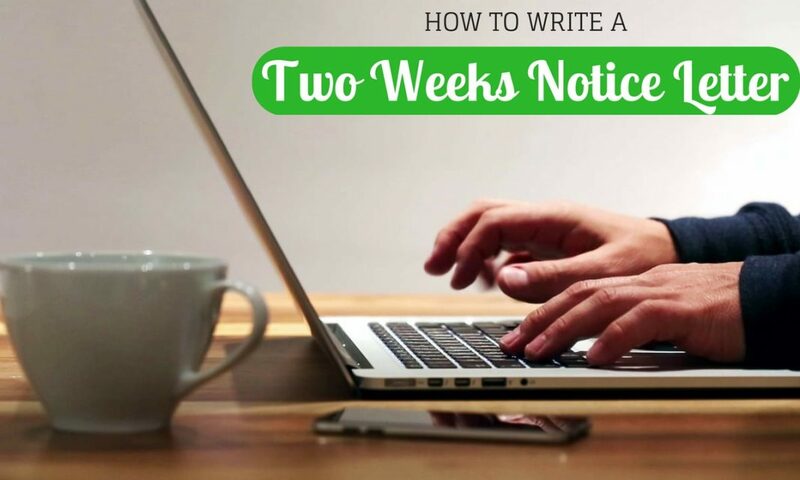 Here are few tips on how to write a 2 week notice. What is Two Weeks Notice Period? In spite of strong need or desire for leaving current job, one cannot just leave a job whenever he/she feels to. While joining an organization, you sign a contract that, certain period of time will be your notice period. Now what does this notice period exactly mean? Notice period can be defined as a time you spend in your organization from your day of resignation to your last working day. Notice period can range from 1- 3 months in countries like India, whereas in western countries 2 weeks notice period is deemed as reasonable amount of time. This time frame allows you to transfer knowledge and hand over the stuff you have been handling. It also gives time for organization to cope with change, either by internally transferring a current employee or by recruiting a new hire. Not serving notice period is considered as breach of contract, and it can severally affect your reputation with the current employer. In this connected world it is not at all advised to burn bridges with your employer. So serving a notice period becomes a must. Although, you can surely negotiate the time frame with your employer mutually. The notice period can be negotiated, when an employee does not have huge dependencies, or other person in the same department can carry out the extra workload. Moreover, when an employee’s personal problem needs to be addressed immediately he can surely discuss the issue with the HR and get an early relieve. Resigning from current job can be an emotional thing to do, especially when you have been associated with the employer for a long time. Before you put your resignation, you should take the following things into consideration. Many a time people put resignation when they get a hint that the interview they gave turned out great and the probability of getting a new job is high. But it is advised not to do so, until and unless you sign the new contract with the future employer and receive the offer letter. Also do not speak about your resignation to your colleagues before accepting the other offer, at times its difficult to judge what action can backfire and create trouble. Before resigning just remind yourself of the good things of the current job, you can analyze the new job offer and be sure of why you are accepting the offer. Even if your current workplace is toxic, you should not move from one toxic place to the other. If you are changing the job the benefits offered by new job should align with your current needs. Resigning can be stressful; you can speak to your friends and family and discuss the pros and cons of the steps you are taking. These people can provide you proper guidance, encouragement and the support you require. If you are taking a break from your career i.e. if you plan not to work for a while, have at least 20% or 3 month of salary in your savings, plan your emergency funds. If you have loans to pay, make sure you plan your expenses and savings accordingly. Analyze which projects require your urgent attention, prioritize tasks and get it done immediately. Whatever benefits like leaves, Medical reimbursement, Vacation you get by your employer gets lapsed once you resign. You can utilize these benefits before that. The time before resigning could be a best time to plan a short vacation, get your long due eye and dental appointments done. This thing is to be done subtly, you do not want to drop hints to your colleagues that you are planning to leave soon. Daily organize one of your drawers and arrange it systematically. Arrange stuff in a way that some new person can easily understand it. Remove any personal sorting style which only you can understand but not others. Make sure you are making things easier for the other person who will replace you. Your replacement calling you for help once you leave can be very awkward and embarrassing. Many people have habit to place there personal photos, plants, cups, notes and artifacts on there work desks. To avoid carrying a big box on your last day you can plan to gradually move stuff. Again be subtle in this, you don’t want to wipe out your desk clean and make it unrecognizable. Also collect things like your salary slips, certificates, and Tax documents. After resigning you may want to meet your close colleagues, associates and clients and deliver the news of you moving on to them personally. It is just a good practice to follow, as suddenly leaving without speaking to people you have been constantly in contact with, may seem odd . Keep your official passwords up to date as, on your last working day you will be required to specify all of them. Giving excuses like you forgot the password as it is saved in system may sound lame and irresponsible. Jot down your achievements, which you can later add in you resume. At times it’s hard to remember without having your official email access. List down the great things you achieved. However, keep in mind not to take confidential information and files. Even the great presentation you yourself made has the ownership of organization and not you. This thing can help you know what your boss might say about you in reference check. Also the positive things he says about you can make you feel good and appreciate for the time you spent with your current employer. Now that you are aware of things to do before resignation let us look at the things you should take into consideration why putting the two week notice. The first thing you should think of is how you can give notice period. Doing it is very tempting to avoid face to face conversation it is wise not to do so, before you provide a written two weeks notice, simply tell your boss that you are doing so. This will simply reflect your empathy and professionalism. Your boss may have a detailed discussion about your reason of leaving. Make sure you communicate the reason clearly without badmouthing the organization or your boss. Even if your boss is bad to you, you should resist to insult him in any way. At times it is possible that company may immediately terminate your employment. This can happen when you are handling a critical or legal matter of company. Hence it is advised to plan your transition accordingly. You may be required to work for two or more weeks or can be relieved from your services within a day. Many people work at a toxic place with a boss who behaves very badly with them. Also you may have negative opinions for companies’ new move or its new product but it is definitely not a place and time to communicate this to your boss. Be nice and say good things about your company. Communicate the things you learnt from them and how it helped you to grow as a person and as a professional. As we discussed earlier you should be clear of the reasons of moving to a new job, your boss may try to retain you by either offering good compensation/benefits or by either promoting you to a higher position with good set of responsibilities. You should be clear of whether or not you wish to continue with your current organization. Also keep in mind that if you get retained, the thought of leaving the organization again will cross your mind in few months. You should be strong and clear when your boss tries to retain you. Speak to your boss and if required to HR for your last date of working, the things you need to take care in your last days. You should also clarify your intentions and plans for next two weeks. If you plan to final customer visits or train your replacement you should clearly state so to your boss. In short the expectations and your intentions should be aligned. You will be paid for last 2 weeks, hence you are not advised to pass time casually and disturb other, Do your work sincerely. Prior to putting you on formal resignation letter you might have discussed verbally with your boss hence the resignation letter should be simple and precise not required to be creative or state the reason for your leaving. Follow the below steps to write your resignation letter. Express gratitude: Every job is a learning experience which helps you to grow professionally. You meet people who can help you in your career or you need good friends during your association in the organization. Thank them for their help. This to inform you that I am resigning from company name, effective two weeks from this date. Though company name, has provided me tremendous learning opportunities it is time for me to move on. I thoroughly enjoyed working here and glad to have helpful superiors and colleagues. I thank you for the opportunities of growth and learning that you have provided me. I wish the best for company name. I am willing to help for my transition and would be happy to train my replacement. This is to inform you that I am resigning from the position of marketing manager with company name. I wish to provide my two week notice effective from today. My association with company name of 5 years has been wonderful. Thank you and my colleagues who have supported and help me grow in my tenure in company name. With heavy heart I say its time to move on. I’ll be glad to help you with the transition. Thanks again. Though resignation is a big step to take, but following the above mentioned steps on how to write your two weeks notice will help in your hassle-free departure. Happy quitting!